It's here! Bikers from across Western New York gathered at a rally in Albion Sunday to put the word out. Motorcycle season is here, and everyone needs to watch the roadways. The Orleans County Chapter of American Bikers Aimed Toward Education (ABATE), gathered outside the Orleans County Courthouse for their annual rally and to remind the crowd that the responsibility rests with each motorcyclist and each driver to keep the roads safe. "People that don't ride, you gotta be aware we're back out there," said biker Chuck Persons. "People that ride need to pay attention all the time. Always be aware of what's around you." "They're not looking for bikes right now. That's one of the biggest things," added Becky Persons. She's referring to drivers of vehicles. Rebecca Grela teaches a motorcycle safety course and lifesaving techniques. "The number one danger is actually intersections," she said. "People taking your right of way, which is turning left in front of you." She said there are added risks nowadays, with so many car drivers on cell phones or text messaging, and not paying attention like they should. "Just be aware and be courteous to each other," she said. Janice Entz wears a vest with patches of the friends she's lost on motorcycles. She says it doesn't deter her from riding because she just enjoys it so much. Janice said it's everyone's responsibility to make the roads safer. Bikers gathered at the rally say it's gaining in popularity as a result of the high gas prices. But that also means there might be more inexperienced motorcyclists on the road this summer. On Sunday there was another accident involving a motorcycle. At about one-thirty in the afternoon, 47-year old Earl Walker of Lockport was traveling east on Route 77 when, according to Niagara County Sheriff's investigators, he lost control of his bike and went off the road. Walker was taken to ECMC with leg injuries. "I was heading back to school and I was driving along route 5. I got a text message, I just looked down briefly and when I looked back up, it was a curve that I wasn't expecting," says Christina Curtis from her hospital room at ECMC,"I lost control of the car, swerved off the road and hit a tree." Curtis, 20, from Williamsville, was driving back to SUNY Geneseo when she crashed. "It was scary," she says. Her car slammed into a tree on route five in the Town of Pembroke. She called 911 and in minutes rescue crews showed up and brought her to ECMC. "Over that five minutes are you thinking, God I shouldn't have answered it," asks Kristin Donnelly. "Yeah, yeah, I just couldn't believe it. I mean (this is bad) but I do text when I'm driving and I never think anything is going to happen," Curtis answers. Last June five Fairport teenagers died in a car crash, on the same road, route 5, fifty miles from Curtis' crash. Authorities believe texting played a role in that crash, too. Kristin Donnelly asks, "Will you text and drive? ""No, no never... never again," she answers. Curtis won't be able to drive for a while. She'll need surgery to repair her shattered heel bone and will walk with crutches for months. "I feel really lucky," she says. She hopes others will think twice before they text and drive after hearing her story. Lawmakers have proposed a bill that would ban texting and driving in New York State. It's in committee in the state legislature. Drivers never imagine that their actions will have consequences! An Erie County woman was injured last night after the vehicle she was driving crashed into a tree in Pembroke, Genesee County. Genesee County Sheriff’s deputies said Christina A. Curtis, 20, of Williamsville, was eastbound on State Route 5 when she lost control of the car and struck a tree near Loverslane Road about 8 p.m.
Today was my first ever "Driving Skills for Life" assembly. After 5 weeks of intense planning it is all over and I am left wondering what to do next. I had spent so much time planning this event and now it's all over. It's just like my wedding day. I spent two years planning it and then, the day arrived and it was over before I knew it. We had a total of 3 assemblies today. This was my first ever assembly and it was truly a thrilling experience. I planned for 5 weeks but learned a mass amount of knowledge re: assemblies in those 3 hours! It went over extremely well and I thank Sgt. Miller for telling me that I did a great job. I never want to let Dave down and always try my hardest to ensure his approval - therefore, hearing from him that I did an outstanding job was my true crown for the day. Thank you to Ford Driving Skills for Life for the resources you provided today. The students loved everything. We had T-Shirts, Music Download Cards, Colored Autographs, Pledges, Certificates of Completion and much more. What so sweet was seeing students walk out in their DSFL T-Shirts and ask for my autograph on them. They were answering segment questions before we could even finish asking the multiple choice answers. The students engaged in that 30 minute video and honestly did learn new driving skills from it. Ford DSFL, you helped me save lives in NYS today. Your dedication to this topic is outstanding!! As I sit here thinking about today, I feel so blessed with my family within the NYS Police. Sgt. Miller has put so much time, belief and dedication into me, my story and my platform. You will find me calling Dave my 2nd father and I know I will for the remainder of my life. He has had the greatest impact upon my life and he truly is amazing!! Sgt. Miller's passion for this topic comes from the heart and I will be forever grateful. Dave, you have been heaven sent and I could not have asked for a better mentor than you. Your an angel! To Trooper Campanella, Trooper/SRO DePlato and of course Sergeant Wilkinson - they have dedicated 5 weeks of their time into the preparation and review of this assembly. I am amazed at the patience, drive and devotion to making my dream a reality. You have all played a vital role in making today's assembly a possibility. We reached over 1000 teenagers today....what an overwhelming experience and sensational accomplishment. Trooper Moralis, thanks so much for jumping in today and helping make things run smoothly. Capt. Lyons, so sweet of you to show up in support of todays assembly. To the school board. THANK YOU and GOD BLESS! You had trusted my DSFL assembly to reach your entire student body. Most importantly, you entrusted me with over 1,000 Iroquois students. You display a true concern for your students ~ an ideal learning environment for our future leaders. Principal Kenney, thank you for all your patience and enthusiasm!! Thank you for the OFFICIAL Iroquois Chiefs hat and T-Shirt. I'm proud to wear them. To the parents that showed up to the evening assembly ~ Thank you. I know you will all reach an optimal level of influence in your young drivers life. You will be the one's making a difference in your teenagers life and their friends. Thank you for all the wonderful comments after the assembly. I enjoyed speaking to each and every one of you. To my mother and father ~ I love you both so much. I was honored to have you both attend the parent's assembly. Mom, thank you so much for speaking from your heart. The parents truly could feel your pain of what it felt like getting that fateful phone call. God blessed me with the most amazing and supportive parents. Love you! Lastly, the students. Each and everyone of you are amazing and I feel fortunate to have had the experience of meeting you, sharing my personal story with you and sharing Driving Skills for Life here in NYS for the first time. You respected me, gave me your full attention and understood that your actions do have consequences. Thank you for welcoming me into your school like you did. I am proud of each and every one of you! I actually signed a few arms today! That was a first! Here I am with the Troopers and Principal Dennis Kenney. 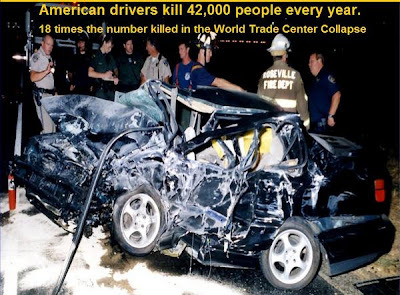 Vehicle crashes are the number one killer of teens in America, claiming nearly 7,000 lives per year. Crash rates are the highest during a teen’s first few hundred miles on the road. In an attempt to reduce crashes among teens, Mrs. New York American Beauty, Jennifer Stehlar and the New York State Police will be conducting the first ever Driving Skills For Life assembly in New York State. The assembly will be held on April 23, 2008 at the Iroquois Central High School. Two separate assemblies will be held from 8 am -9 am & 9 am – 10 am. The parent assembly is at 7 pm. 1,000 PLUS Autographs to sign and handout tomorrow!! Right now I am signing 1,000 + autographs for the Assembly that the NYS Police and I are conducting at Iroquois High School tomorrow. We will be making a video of the assemblies and I will be sure to post it here for all to see. This is my first assembly!! I know this has NOTHING to do with safe driving BUT anybody that truly knows me will laugh with me at the below horoscope. You are a hard and conscientious worker, jennifer, and sometimes you work so hard that you neglect to take any time for yourself. This is admirable in the short run, but stupid in the long run. You do no one any good if you burn out from sheer exhaustion. You must learn how to pace yourself and balance your life in such a way that there is ample time for work, play and meditation. I felt so bad last night. The last few weeks have been some of the most exhausting as I have put every moment of my days into learning how to build an assembly, building the assembly, researching teen driving, researching the parents information and of course the crazy proposal I worked on. It is exciting to recognize the wealth of knowledge I now have on the topic and the progress I have made. It was tough considering that Sgt. Miller (who is like a 2nd father to me) was on vacation and I had to do everything without his input ~ which I am used to having! I know every ounce will be worth it in the end and I am just waiting impatiently until Wednesday the 23rd when I finally see the end result!! "Thank you for keeping the dream alive." It's just all so ironic to me, that last night this was found and those words were written so long ago. It's as if they were just written today. Last night, I got a few things from my parents that were stored away from my childhood. One item in particular are the following scanned in documents. They were in one of a million scrapbooks that I made in my childhood. At the time of these publications/photos, I was in 4th grade - 8 years old. My cousins made this record in memory of Mindy Beals, a local teenager killed by a drunk driver. My cousins traveled the state promoting the topic AND the greatest accomplishment in my opinion was the day they sang this song for the President (Reagan) and First Lady at the White House. I was so excited to see these items last night. Isn't it strange that all these years later I am now a survivor of a near fatal car crash and I now spend every living breathing moment as an advocate for safe driving! In 4th grade, they were my hero's and I remember praying that I would be just like them! Almost as if this path was paved for me before I ever knew! 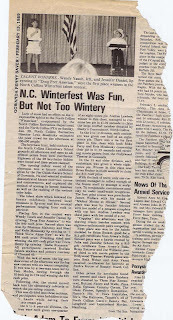 The above news article (Feb. of 87) displays a photo of me in the local town winter festival. I was the one sitting @ the keyboard. I actually was lip sinking their song "Drug Free America." I was pretending to be my cousin Frankie. The message is still alive! 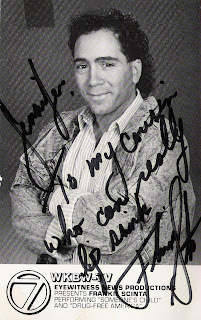 It amazed me to hear that my cousin Frankie Scinta still keeps the message alive. It's amazing! 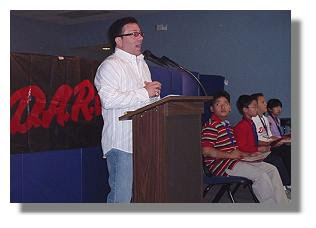 Frankie Scinta (he of the Scintas show at the Rio) was guest speaker at the Drug Abuse Resistance Education (D.A.R.E.) graduation this week at Lucille Rogers Elementary School. 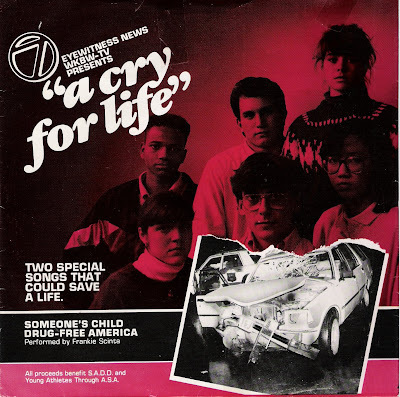 Did you know they wrote and recorded the song "Drug-Free America" in 1988? Did you know they became part of the "Just Say No" campaign? Did you know they were also invited to the White House to meet the President and his First Lady, Nancy. The answer is yes! 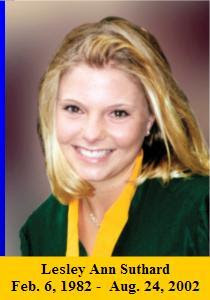 On August 24, 2002, Lesley Ann Suthard, age 20, died a death so devoid of meaning that society calls it an accident. Accident, a throw-away word, gives the impression that there is no one to blame for what happened. It implies that Lesley’s death was a mistake, that it was not preventable. Lesley’s death was certainly not an accident. It was the predictable result of a driver’s choice to drive in a manner that ignored the possible consequences of his/her actions. Lesley was my daughter. I started Lesley’s Crusade to reduce the number of deaths from reckless driving. Every day each of us makes a choice whether to drive according to the traffic laws or not. If we do not obey the traffic laws, we increase the likelihood that we will be involved in a traffic crash or cause one to happen to someone else. MADD (Mothers Against Drunk Driving) reduced the number of fatalities from drunk driving 20% from 1982 (the year Lesley was born) to 2002 (the year Lesley was killed). They have done an outstanding job. Now, the threat has changed. While 40% of all fatalities now are alcohol related; 60% are not. Reckless drivers are not all street racers. They are not all teenagers. Quite often they are middle-aged men and women who are otherwise responsible, wonderful neighbors, great providers for their families; people who would never think of breaking laws and endangering innocent lives.And yet, these same people speed, rush the red light, pass on the right to gain a few car lengths, turn right on red without stopping, and coast through stop signs. Why? Lesley Ann Suthard had no idea that as she was driving home on a Saturday evening, a young man, driving recklessly, would lose control of his car, cross the median, and hit her head on at 90+ mph. The two young men in the car that hit Lesley were a part of a group of seven young people who had been bowling at Rocklin Lanes and had left to get ice cream. They traveled in two cars: The young man and his passenger were in Car A; the five others were in Car B. Their route was west on I-80 then north on Hwy. 65. Both cars (A and B) were speeding (between 70-75 mph) in the fast lane, with Car B in front of Car A. A witness in car D told police that Car A “blew by” him and admitted that he (car D) was traveling 85 mph. Car A pulled right into the slow lane and accelerated dramatically. In doing this, Car A was overtaking an unrelated car (Car C) directly in front of him and found himself with no where to go. Car B was still to his left, at least partially. Car A squeezed between the two cars as it pulled left into the fast lane. Car A then lost control, crossed the median and crashed into Lesley’s car (Car L). The two young men in the car that crashed into her were not wearing their seat belts; and, were both ejected from the car. One died in route to the hospital, and the other died the next afternoon. There is now a median barrier at the location of the crash. POEM: "Went to a Party Mom"
I remember the day that my mother gave me this poem and I thank her for it. Never did I drink as a teenager OR mix the two (drinking & driving). I remember one snowy night, I was 17 and just around the corner at a friends house. Mom had dropped me off. I didn't have my own means of transportation and when the time came to go home, I remembered my promise to my mom. Never to drive drunk OR drive with someone who had been drinking. I was NOT drinking but everyone else had been. I was so scared to tell my mom but had no choice considering I wanted to get home in one piece. I called my mom and she was there in a heart beat. Thank you mom and I love you. I went to a party, And remembered what you said. You told me not to drink, Mom, so I had a sprite instead. I felt proud of myself, The way you said I would, that I didn't drink and drive, though some friends said I should. I made a healthy choice, And your advice to me was right. The party finally ended, and the kids drove out of sight. I got into my car, Sure to get home in one piece. I never knew what was coming, Mom, something I expected least. Now I'm lying on the pavement, And I hear the policeman say, the kid that caused this wreck was drunk ,Mom, his voice seems far away. My own blood's all around me, As I try hard not to cry. I can hear the paramedic say, this girl is going to die. I'm sure the guy had no idea, While he was flying high. Because he chose to drink and drive, now I would have to die. So why do people do it, Mom Knowing that it ruins lives? And now the pain is cutting me, like a hundred stabbing knives. Tell sister not to be afraid, Mom tell daddy to be brave. And when I go to heaven, put Mommy's Girl' on my grave. Someone should have taught him, That it's wrong to drink and drive. Maybe if his parents had, I'd still be alive. My breath is getting shorter, Mom I'm getting really scared. These are my final moments, and I'm so unprepared. I wish that you could hold me Mom, As I lie here and die. If you're planning to tip a pint or two during this St. Patrick's holiday weekend, be warned - local police are watching. A police DWI checkpoint was set up last night on Transit Road in the Town of Elma. News 4 cameras were there to witness several arrests and it's the first of many to be held at unannounced locations throughout Western New York. Mrs. New York, Jennifer Stehlar is again serving as a celebrity spokesperson for the checkpoints. Several years ago she and her father were critically injured in a crash. Five fatal car accidents in less than five days have prompted police to take action. The accidents occurred throughout Western New York, including ones in Grand Island, Carlton, Evans, and two in Bergen.In four of the five accidents, the driver was not wearing a seat belt. The recent deaths have sparked a driving awareness initiative and is supported by Mrs. New York AB. "My father and I were in a near-fatal crash together," said Jennifer Stehlar. "The person made a left hand turn in front of us and we had no where to go. If we had not been wearing our seat belts, I personally don't think we would be here today. I was given another chance and I hope my story can change a few lives." Stehlar, along with the New York State Troopers, plan to increase their efforts of educating the public on the importance of wearing a seat belt. "Our goal is to get the message out anyway we can," said Sgt. David Miller. "It doesn't take much, it's a simple act of buckling up." The Driving Awareness initiative will be carried out throughout the year through education and enforcement efforts. Here is another portion of my "letters from Heaven." I will try to remember to add these uplifting messages on this blog when I have the chance. It's always great to be reminded that our passions do make a difference in others lives. It's also great to read messages like this when I am experiencing a day of excruciating pain from these crashes. Every little bit to place a smile on my face during those episodes is priceless. Talking on your cell phone while driving is illegal in New York and four other states. Now some New York State lawmakers want to add texting. State Police say distracted driving is the number one cause of all car crashes, and can be deadly. Being able to multi-task is usually considered a good thing, but texting while driving can be a deadly combination. According to a Zogby Poll, many are not concentrating or even paying much attention while driving. Two out of three 18 to 24 year olds admit they text while behind the wheel. Phone records from last June in Rochester indicate a 17 year old driver's phone was being used to text when she swerved into oncoming traffic. Five teenage girls were killed, their families plunged into a lifetime of grief, but horror stories like this have changed behavior. "In a month, I probably do 1500 text messages. That's no lie," says 20 year old Tim Arnold. We asked Arnold and 18 year old Lauren Numrich to join us at the State Police Academy driving course to help us see just how dangerous it is to text and drive at the same time. We asked them to weave their way in and out of cones while we sent them text messages, interrupting their driving concentration. All it takes is a split second. One hand on the wheel, the other on their phone, thumb frantically searching for the right key, eyes darting back and forth. It was easy for Tim and Lauren to be dangerously distracted. "You really need two hands on the wheel and only being able to have one hand to read and write back made it a lot harder," said Lauren. We asked them to respond to texts like, where do you live, what's your birth date, avoiding one word answers. "I just hit every single one of the cones, oh my gosh. Did you respond yet? Nope," said Lauren. State Police say that proves their point. "Somebody jumps in front of your car, makes an unsafe lane change in front of you. If you're not concentrating on the road, it's hard enough to react anyway. If you are concentrating on a text instead of the road, it becomes almost impossible," said State Police Sergeant Matt Daley. It's no big deal if you misspell a word while texting and it's even understandable if that happens while you're driving, but make an error behind the wheel while texting and you might not get to send another message. There are currently two versions of a bill in the state legislature. If one passes and you get caught texting while driving, you'd be looking at a $100 fine. ELK GROVE, Calif. -- An Elk Grove family is warning teens and parents about the dangers of texting while driving. An 18-year-old relative was killed this week in a head-on crash, because she was focused on her cell phone. Carol Totlis is speaking out so other teens won't make the same mistake. Meanwhile, the state Legislature is considering a bill that would address the issue. Police in Peoria, Ariz., call the Monday crash one of the worst they've ever seen. Officers said the teen was text messaging at the time of the wreck, which killed her and the driver of the other involved vehicle. Totlis said lawmakers shouldn't wait any longer to make text messaging while on the road illegal. The legislation has gone through the Senate and will possibly go to the Assembly floor on Monday. Copyright 2007 by KCRA.com. All rights reserved. The Western Chapter of the New York Association of Pupil Transportation announced that today, April 2, 2008 has been designated as OPERATION SAFE STOP DAY. Throughout the day the New York State Police in conjunction with numerous local police agencies will follow school buses throughout the area looking for motorists who illegally pass or overtake a stopped school bus. Law enforcement officers throughout the area will be strictly enforcing this vehicle and traffic law. Everyday in New York State, over 2.3 million children are transported to and from school on school buses. The Western Chapter of the New York Association estimates that some 50, 000 motorists will illegally pass a stopped school bus on any given day of the school year. "Motorists need to realize that having a driver's license is a privilege, and along with that privilege are the laws they must follow. It is an ongoing effort to make the public aware of Section 1174 of the New York State Vehicle and Traffic Law which states that it is illegal to pass or overtake a school bus that is stopped for the purpose of receiving or discharging passengers," stated Kim Sobczak, President of the Western Chapter of the New York Association for Pupil Transportation and Transportation Supervisor of the Holland Central School District. New York State Police Captain Dan Lyons, spoke at the press conference and stated, " The goal of this important highway safety initiative is to ensure the safety of our school children while loading and unloading school buses. We know that multi-agency participation; vigorous traffic law enforcement and media coverage of our efforts are proven highway safety strategies. Troopers, deputies and local police officers will be following school buses while their red lights are flashing. Passing a stopped school bus is a violation of Section1174 of the NYS vehicle and traffic law. Motorists can face fines up to $400, 5 points on their license and up to 30 days in jail for their 1st offense and increased fines and jail time for subsequent convictions. Last year, Operation Safe Stop resulted in 1, 035 motorists being cited for passing a stopped school bus." Numerous law enforcement agencies and officials gathered today at Sidway Elementary School in Grand Island to support this important initiative. Those in attendance included Grand Island School Superintendent Robert Christmann, members from the Erie County Sheriff's Office, Town of Tonawanda Police Department, Town of Grand Island Police Department, Amherst Police Department, Cheektowaga Police Department, Village of Kenmore Police Department and Town of Hamburg Police Department and Mrs. Jennifer Stehlar, Mrs. New York American Beauty 2008. The below is text from an e-mail that I cut and pasted. This letter keeps me going on my days of pain. Pain is draining and can truly exhaust all efforts to continue forward with my mission but there will always be a new story or an e-mail from someone that I have saved and I get right back up and continue on my journey. Letters like the one below are letters from God. God's reminder that what happened to me was for a reason and the reason is to save the lives of others with my personal passion that was ignited by the events in my life & the pain I endure on a daily basis. That's the defining moment when I remember how truly blessed I am. Before I get onto other things, I want to make sure I got our contact information out to you as promised. Attached is a .pdf file of our business cards. It was a pleasure meeting you this morning.We really appreciate you taking the time to be with us this morning, and your dedication to preventing traffic injuries & deaths. I have been dedicated specifically to traffic safety for more than 15 years (and a Trooper for 20), and I know we are saving lives every day. I also know that one of the challenges is keeping the messages that impact behavior fresh and creative to rise above the information chatter. We are certainly lucky to have your assistance in doing that. I hope you take pride in knowing that somewhere, sometime, some person will remember your message and put on their safety belt and that act will save their life. You likely will never know who, but rest assured, they are real. As real as those who lose their lives today because they did not. We will not know them either, but I will read about them when the report of their deathcomes across my desk tomorrow, as they do every morning. Thank you for making those messages fewer in the future. Thanks to my newest and most amazing friend, Deanna Russo (of Crusade Against Impaired Driving) for joining me at the 2009 Miss Buffalo (MAO) Pageant. We had a great time and I have to say, thanks for listening to them announcing my name as we were in the ladies room...LOL... It's always great to have the spotlight on me when leaving the ladies room. CONGRATS to Chelsea Prophet for capturing the title, congrats to the wonderful Kathleen Ang on first runner up placement and of course.....congrats to all of the young ladies on an amazing competition. It's always wonderful to sit back and watch these young ladies so full of life, passion and appreciation chase after what only starts out as a dream. Everyone of these ladies are so well rounded and again, I thank the Miss American System for providing them with a spotlight to showcase their talents and beliefs to a larger audience. It's been so touching to watch all of them become polished women. I'll always remember giving them motivational coaching sessions, helping them with wardrobe and talent. In the end they blossom into woman who can do it all on their own. That's when I cry. My little girls don't need me any longer.............All I have to do is sit back and watch them compete. As for tonight's pageant, it was a great show!! The pageant was not going to take place this year BUT 6 weeks ago MaryAlice decided to do so. They had to get all the sponsors on board, let the gals know there was a pageant and so on. When I arrived tonight I was blown away by what MaryAlice and her group were able to accomplish in such a short period of time. I was a Miss America contestant and titleholder back in the late 90's. It is just wonderful to see the passion of this organization continue on for generations. Especially Miss Buffalo b/c of what MaryAlice Demler has been able to continually procure. NYS Trooper and School Resource Officer: Joe DePlato and I reviewing the DSFL materials for an upcoming assembly. ALBANY, N.Y. (AP) -- State lawmakers have agreed to keep troopers in schools and to keep open some medium and minimum security prisons targeted for closing to save money. Both the state Senate and the Assembly have rejected former Governor Eliot Spitzer's idea to reassign about 200 state troopers from schools and video slot-machine centers around the state to high-crime areas and the Canadian border. Lawmakers also nixed the former governor's plan to shut four prisons, which together were projected to save $33.5 million dollars in the 2009-10 budget year, plus nearly $30 million in capital costs. Spitzer -- who resigned last month after he was identified as a customer of a high-priced prostitution ring -- proposed the moves as part of a plan to close an estimated $5 billion budget gap. The Legislature and Governor David Paterson are expected to approve a final spending plan by the end of this week. ARTICLE ON A WONDERFUL FRIEND OF MINE: SRO- TROOPER JOE DEPLATO, this gives a bit of insight into the world of SRO'S and their importance. After spending 20 years with the State Police, Trooper Joseph De- Plato was ready for a change and a break. So when he heard that the Iroquois School District was in the market for a school resource officer — that’s bureaucratese for a police officer in the school — he submitted his name. Five years later, he got the change he was hoping for. But not the break. Part cop, part teacher, part social worker, part traffic consultant, part community liaison, the school resource officer is becoming firmly entrenched in the educational culture. Schools thought they might need them post-Columbine, but now more want them for dozens of other reasons. At the same time, political and financial realities could make it more difficult for schools to get officers in the buildings. In his final budget as governor, Eliot Spitzer proposed moving the State Police from the schools into high-crime areas. Although he won’t be around to make the case for that idea, it was already getting resistance. State Sen. Dale Volker held a news conference last month to tout the success of school resource officers. Tellingly, he held it at Iroquois and was joined by school administrators and town officials. During an hourlong interview in his office — interrupted by one thank-you from the principal, one phone call from the worried mother of a former student and one invitation for birthday cake — DePlato reiterated that he goes where his bosses assign him. But it also became clear that he believes that the work he has done in the last five years rivals what he had done for the previous 20. He hears about fights and mediates settlements by gently reminding the would-be combatants that he can arrest them. He hears about planned parties where alcohol will be served and alerts — in some cases, warns — the parents. He has taken kids out in handcuffs, acted on threats of violence and conducted locker searches with drug-sniffing dogs. As need dictates, he takes students who might be on the cusp of making seriously bad decisions to Collins Correctional Facility to show them where they could end up. He also goes to school dances, meets with former students who need help, hands out diplomas on graduation day and teaches classes when they pertain to police work. For a sociology class, he brought in a polygraph; for physics, an accident-reconstruction specialist. When the district bought athletic fields across the street on Girdle Road, he noticed that the plans would have created a dangerous crossing, so he worked with the town and the county to get a traffic light installed. After the news conference, the students had their say. The kids who know that DePlato can arrest them, who know he has ruined their parties, called their parents, scared them with a visit to prison, let him know what they thought of him: They collected 900 signatures on a petition opposing his reassignment. Drinking and driving will NEVER mix. 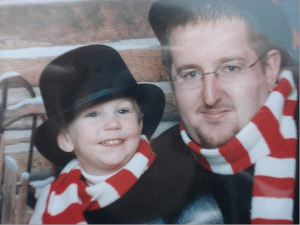 This 6 year old had to learn the hard way as his father was run over and killed by a drunk driver! Family and friends have now set up a fund for Kevin Coffta's six-year-old son Dawson. Coffta was killed Wednesday when he was struck by an SUV while towing a vehicle on the I-190.It happened shortly before 5 A.M. on the I-190 south in the Town of Tonawanda, just south of the I-290 interchange.Police say the Coffta was removing an abandoned car from the right shoulder of the road when he was hit by a car. That car then went airborne, rolling over twice, coming to rest on its roof.Coffta, 28, was pronounced dead at the scene.The driver of the car, David Brown, 64, of Cheektowaga, is charged with vehicular manslaughter and DWI. I just started with a new massage therapist and she has been wonderful! Her name is Erin. When I went in for my appointment this afternoon, she said, "I have something to tell you. When I got home last night, my son pulled out his "take home" folder from school and guess what I found in it?" AN AUTOGRAPH FROM YOU JEN!!!! LOL..
Erin said that when she pulled the autograph out, she started to laugh and her son asked why. Erin replied, she's one of my patients Dylan! He replied, I know why she's your patient mom. Erin said, well why don't you tell me Dylan! He replied: Mrs. New York was in a very bad car accident and she almost died BUT her seat belt saved her life! Seat belts are very important mom. This was a 6 year old child that I had met at the "Operation Safe Stop" press conference. I can not believe how impressionable young children are and hearing that story truly made my day. That is one more life that I have made an impression during my journey. Hearing that story was truly a gift! As I lay here in unbearable pain which is causing knots in my stomach, I still wonder how an individual can continue to live like this? The only thing that I can do is pray. Pray that it stops, pray that God can give me the strength to get through another day of this. I can NOT remember what life was like before this. Who was I before my car crashes? What was it like to wake up with out any pain? Well, I don't know and it is something that my husband asks as well. Yesterday, I was back and forth to the microwave. I was constantly reheating my oatmeal bean hot packs. One for my TMJD and the other for my thoracic. Doug looked at me and said, how do you do it? Baby, You look so drained. I wish I could take it all from you. The truth is that this pain changes who I truly am. I hold it in so much and try to not complain BUT then I start acting miserable with others. I am short with them & have no patience. God has given Doug an unlimited supply of strength b/c he can treat each day of pain as if it were new to him. He can make me laugh and can sit for hours rubbing my Tembo-Mandibular Joint or my back. He has a heart of gold! I hope and pray for all drivers to understand that handling a vehicle is like handling a weapon and you can tragically take the life of someone else or yours at any time. That means that every 5 seconds a life will be changed FOREVER! Not only is the life of the victim changed but the families as well. This needless tragedy has a trickle down effect causing all to be harmed. Actions have consequences. Careless and reckless driving is 100% preventable. My position on this topic will stand firm. The rest of my breathing days are committed to this topic and making sure that other families do NOT endure the pain these crashes have causedmy family and I.